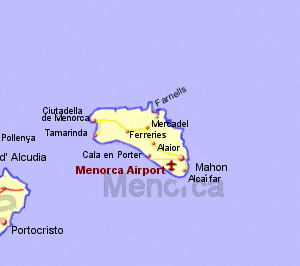 Menorca is the second largest of the Balearic Islands and possibly the least developed apart from Formentera. Menorca is scattered with prehistoric monuments or stone remains, many of which baffle expeerts as to their original function. Mahon, the capital of of Menorca, is situated of the east coast, has a deep water harbour, and, having been occupied by the British for most of the 18th century, has a Georgian appearance. On the southern coast of Menorca is Cala Santa Galdona, an attractive cove which has been developed in in a controlled fashion. Ciutadella on the western side of the island used to be the capital of Menorca until the British decided that it's inlet did not provide a sufficient harbour facility and moved the capital to Mahon. The result is that Ciutadella maintains much more of it's original character, which is more Andalucian, and is a very attractive town. There are a number of attractive coves around Ciutadella. On the north coast of Menorca is Fornells - a pretty fishing village that has long been popular with tourists having a number of attractive cove beaches nearby, particularly Binimel-La and Cala Pregona.